Don’t worry, all of that staring at a computer screen on Cyber Monday did not affect your eyes: this is the second Village Square of the week. With so much happening in the board game industry these days, we decided to expand the Village and report the news twice a week for the same low price of free. Enjoy! 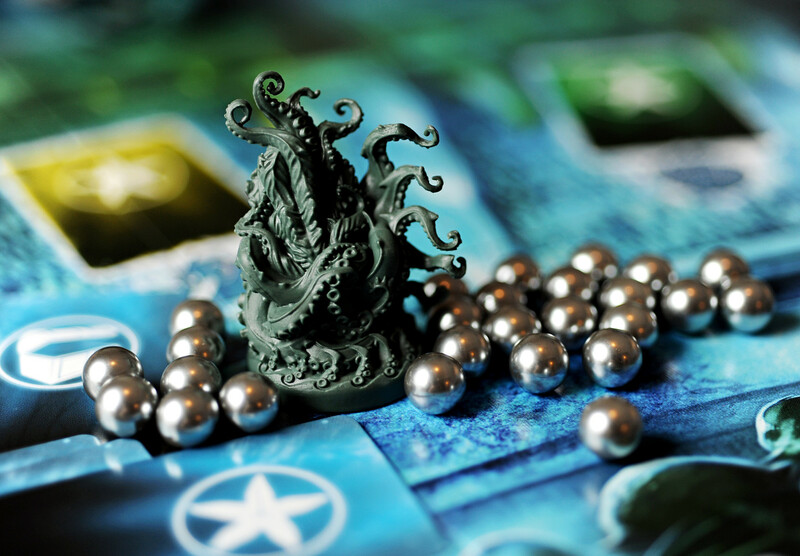 Asmodee announced that Abyss: Kraken, the expansion to the popular Abyss, will be released in early January. The good folks at dailyworkerplacement.com have provided an in-depth look at the Kraken and publisher Asmodee has posted a video of expansion’s contents. The long-running joke of Dominion’s digital release/un-release is a joke no more. After years of delays, the ever-influential Dominion is finally available for iOS and Android. Say what you will about Cards Against Humanity, but they certainly know how to make a buck. While every retailer in the world was slashing prices on Black Friday, CAH was the only one that sold nothing. Yes, people actually paid $5 for absolutely nothing. Here’s a first-person account of this year’s BGG.CON. Speaking of first-person accounts, I enjoyed this look back at Spiel. Over 150,000 people attended the event and over 1,000 played in a gigantic game of Catan. This guy created a custom 7 Wonders card to propose to his girlfriend. A pilot opened a board games store in the United Arab Emirates while continuing to pursue his other passion, aviation. We need more game nights like this: players of various faiths got together to play games. January 8-10. MACE East. Wilmington, North Carolina. January 15-18. Brycecon 2016. Bryce Canyon City, Utah. January 22-24. EsCon 2016. San Marcos, California. January 30-31. GCOM’s Winter Game Fest. Rockville, Maryland. February 19-21. OwlCon. Houston, Texas. February 22-28. PrezCon 2016. Charlottesville, Virginia. March 4-6. Tennessee Game Days. Franklin, Tennessee. March 4-6. FallsCon 2016. Witchita Falls, Texas. March 18-20. Meeplecon. Las Vegas, Nevada. April 1-3. Gaming Hoopla. Gurnee, Illinois. April 9-10. Unpub Games Festival. Baltimore, Maryland. April 22-24. Rocket City Gamefest. Huntsville, Alabama. April 22-24. LexiCon Tabletop Gaming. Lexington, Kentucky. May 19-22. Geekway to the West. St. Louis, Missouri. June 15-19. Origins Game Fair. Columbus, Ohio. June 17-19. PolyCon 34. San Luis Obispo, California. July 6-10. Dice Tower Gaming Con V. Orlando, Florida.